Follow easy, step-by-step, photo illustrated instructions for making this delicious Ham Bone Beans recipe. Use that leftover ham bone, or ham hock, to make this creamy bean dish that can be served as a side dish or a main dish either one. We’ll show you how to make it and we’ve got a printable recipe to go with it. I finally found a way to use the leftover ham bone I’ve had in the freezer for the past couple of months. I placed it there after I completed making the Baked Picnic Ham Recipe that I posted here on Taste of Southern some time back. I’m glad I saved that bone. I also had about half a package of dried Northern Beans leftover from making another recipe and had already sorted through the beans and placed them in soak when I decided to make Ham Bone Beans. Amazingly, for me, I even had some celery in the refrigerator. I don’t normally have celery on hand around here. The beans had soaked over night and I was just going to cook them up with a ham hock when I spotted the ham bone in the freezer. That’s when I sat down and put this recipe on paper and began taking pictures of the process. It wasn’t my original plan but isn’t it neat how some things just happen that way? It’s really a simple recipe and the end product turned out to be absolutely delicious. I added a little mixture of flour and water towards the end to thicken up the broth and that just turned the recipe into a creamy, almost soup like texture. Originally, I figured it would be just a good side dish but, after making some hoe cakes, I turned it into a main dish for my supper. 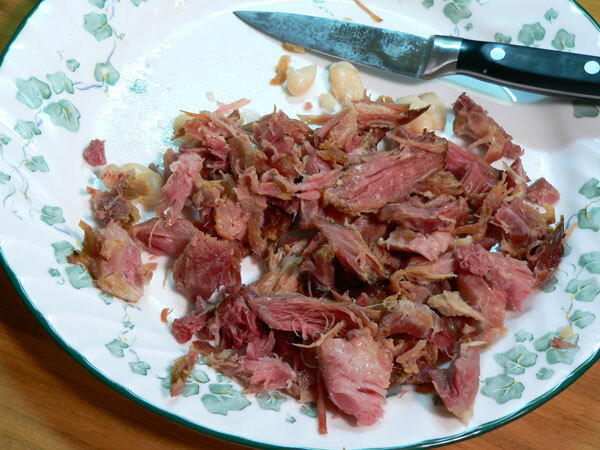 You can use a leftover ham bone if you have one, or ham hocks if you have those. Just make it a bit meaty and dig in. Are you ready to give it a try? Alright then… Let’s Get Cooking! 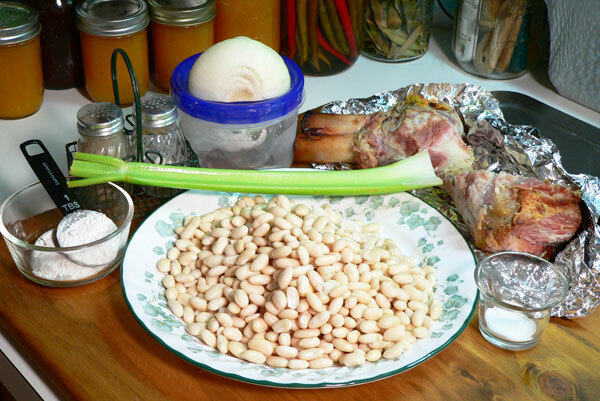 Ham-Bone Beans Recipe: You’ll need these ingredients. OK, I’m jumping into this recipe a little further than usual. So, to catch up a bit, you will need to sort through your dry Northern Beans to remove any bad beans, stones, or any other foreign items that might have ended up in the bag. Beans are harvested mechanically these days and they are not washed prior to being packaged. You need to check them for foreign objects before proceeding with any recipe. The photo above is where they were after soaking overnight in water. Now, let’s move on with the recipe and use up some leftovers. After soaking the beans overnight, drain them in a colander, and then rinse them under cold running water for a couple of minutes. Stir the beans around to help remove any dirt or dust that might be on the beans. Place your ham bone or ham hocks in a large sauce pan. This one had been in the freezer for awhile but it’s fully cooked. I just added it to the pot as I knew it would warm up sufficiently by the time the beans were complete. Add the rinsed and drained beans to the pot. 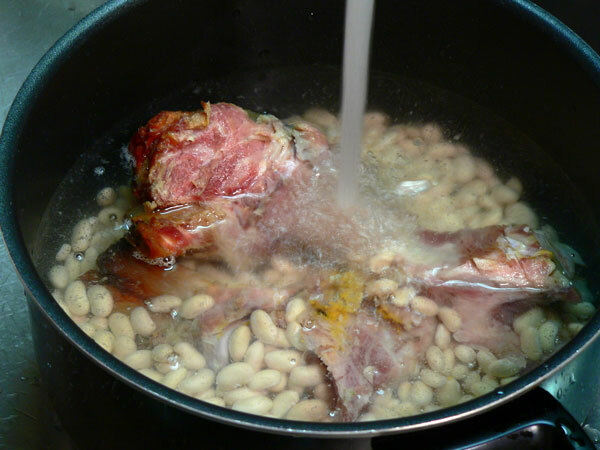 Add enough water to the sauce pot to cover the ham bone and beans with about three inches of water. Place the pot over Medium Heat on your stove top and let it come to a low boil. We’re going to let the beans cook, uncovered, for one hour before we add our seasonings and other items. You’ll need to stir them about every 20 minutes as they cook and to just keep an eye on them. After about an hour, remove the ham bone or ham hocks, set them aside, and let them begin to cool. 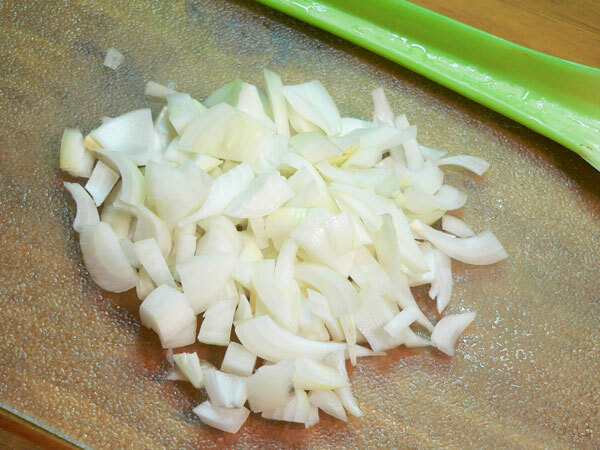 As the beans near having cooked for about an hour, chop up the onions. Then, chop the celery into small pieces. 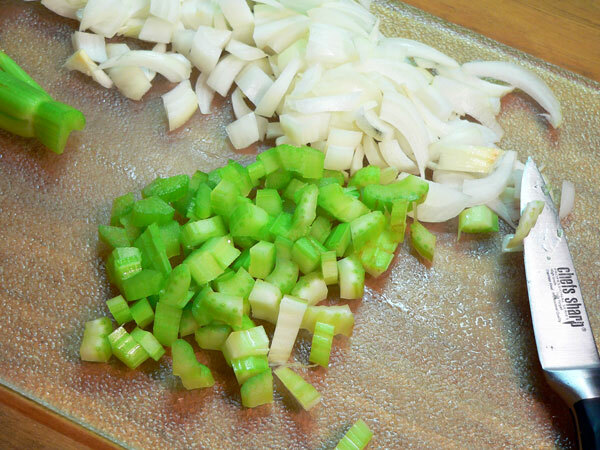 Add the chopped Onions and chopped Celery to the cooking pot of beans. Remove all the meat you can from the bone once it has cooled enough to where you can handle it without burning yourself. Place the meat back in the pot and allow the beans to continue to cook until they are done. You’ll need to taste the beans in order to be sure they are soft and tender to your liking. You’ll also want to taste them to see if they need more Salt or Pepper. 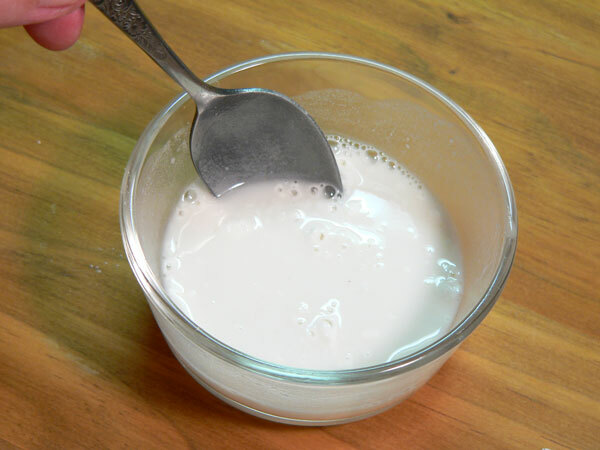 Mix two Tablespoons of Flour with enough COLD water to make a slurry. Stir it until all the large lumps have dissolved. Add the Flour and Water mixture to the pot of beans and stir it in well. Let the beans continue to cook for a few minutes longer and it should thicken up into a nice and creamy broth. This will really depend on how much liquid you have remaining after the beans have cooked down. Adding the thickener is optional by the way. If you don’t want it to be creamy, just serve them as they are. It’s up to you. Serve the beans while warm and… Enjoy! 1 leftover Ham Bone or Ham Hocks. Sort through dry beans removing any sticks, stones or other foreign items. 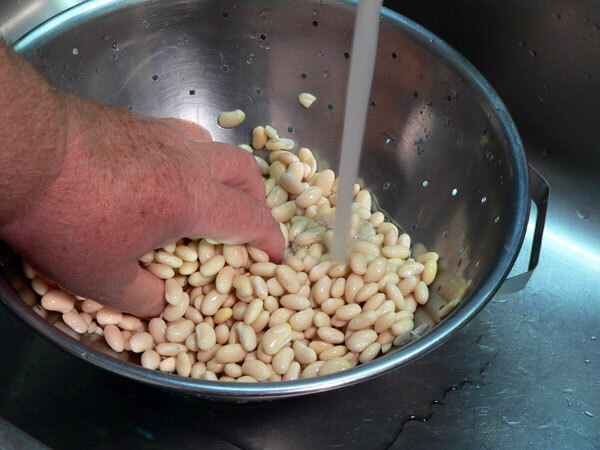 Drain beans, rinse under cold water and set aside. Place the cooked ham bone or ham hocks in a large sauce pan. Add enough water to cover the beans and bones by about three inches. Place over medium heat, bring to a low boil and let cook for one hour. Remove the bone, set aside and let cool. Add Black Pepper and stir well. Remove any meat from the bone and discard the bone. Return the meat to the pot with the beans. Continue to cook the beans until they are soft and tender. Taste the beans and add additional salt and/or black pepper to taste. Mix flour and water, removing any large lumps as you stir. Stir the mixture in the beans and let cook for a few minutes longer to thicken. Your Comments: How do you like to use any leftover ham bones? Do you make soups with them? I’d love to hear your comments and thoughts on our recipe. I do hope you will try it and come back and let me know how it turns out for you. It will only take a minute or two for you to share your thoughts in the Comment section below. Please know that all Comments are moderated. That just means that I read each and every one of them before they are approved for our family friendly site here on the Internet. Thank you for sharing your comments with us. It might encourage someone else to give our recipes a try as well. Sign Up For Our Free Newsletter: Before you go, be sure to sign up for our FREE Newsletter that we send out each week. I try to post a new recipe each Monday and then send out a Newsletter to let you know that a new recipe has been posted. It’s a great reminder to keep you up to date with whats happening here on taste of Southern. The Newsletter is absolutely free and you can find the Sign up box below or in the top right hand corner of each page. Also, should you ever decide that you no longer want to receive our Emails, it’s even easier to unsubscribe. Thank you for telling your family and friends about us and helping us spread the word about our home here on the net. My prayers for you Carolinian’s safety during and the aftermath of Hurricane Florence. I certainly agree that all things ham are enjoyable. While carving a ham, I place all scraps and the cleaned cracked bone in a 6 qt. lined crockpot. Fill pot to maximum capacity with water. After 3 or 4 hrs. on low, remove bone, pick and reserve meat. Return bone to pot and cook bone and scraps (being skin, gristle and fat) all total 8 hrs. or so. I cool a bit and strain through a large colander lined with cheesecloth. Refrigerate the broth until the fat congeals. Discard the scraps. This is concentrated enough that a 1 qt. freezer container flavors a lb. of beans. Add a bit of leftover sliced ham to each container. 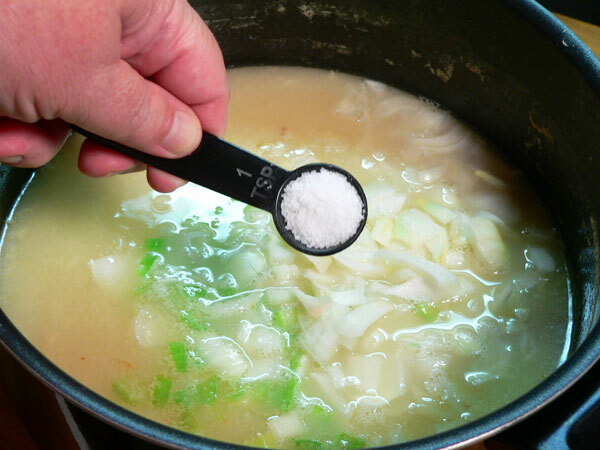 This saves prep time when you want a pot of beans, cabbage or greens and retains a good flavor. I love the looks of this but I have never had a hambone left that I did not use to make Potato soup. Prepare the potatoes as you like and cook in the pot with the bone and enough water to cover, much the same otherwise, salt pepper thickening, add the ham back. I think I will have to go buy a ham, so I can make some soup with the leftovers. Merry Christmas to you Steve. and a safe happy new year. I always do this: start making something and THEN look up a recipe, almost as if to privately gloat that I’m doing it correctly or something! Anyway, your site is friendly and straightforward and happens to coincide pretty much with my own idea, at least for this dish. I used a leftover ham bone and added about half a canned chipotle chile in adobo, some jerk seasoning, a chopped clove of garlic, and a little chicken Better Than Boullion (great stuff). I’m cooking them longer to thicken the broth without adding flour. 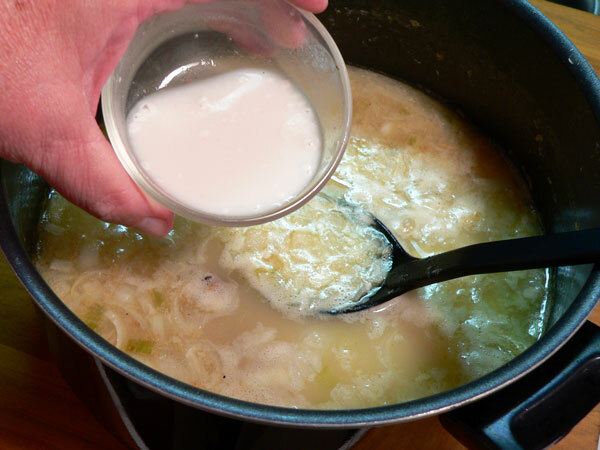 Adding bones to any broth infuses it with collagen, giving it an unctuous, silky texture without adding thickeners. I’m not adding sugar, although I can see the point. I just find ham to be a bit sweet on its own. I do add a little to collards and other leafy greens if they’re bitter. I appreciate recipes so faithful to tradition. Thanks for keeping it real. Steve, those corn fritters in the photo look good? I know they go by names in the South (corn cakes, hoe cakes, Johnny cakes, etc. ), but we always called them corn fritters because that’s what mammaw called them. If you have a recipe for them, I’d love to have it. I plan on making this soup this weekend and having these with them would be great. Thanks! 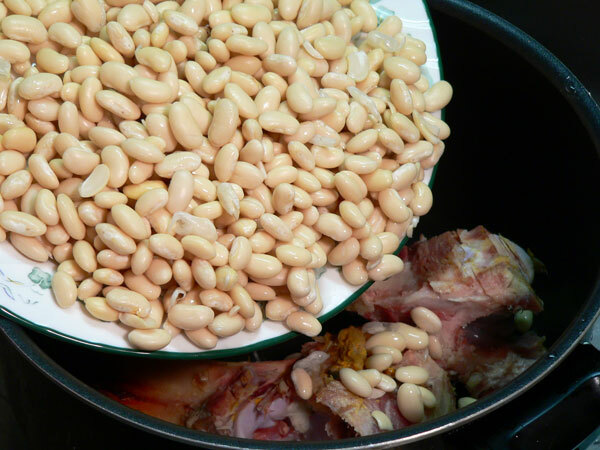 To thicken your broth, you can take a cup or so of the cooked beans, puree them in a food processor and add the puree back to the pot of beans. Left over ham bones with large lima beans is one of my favorites. Don’t forget the sweet cornbread when you have ham and beans! This recipe is great. I used a leftover hambone and pinto beans. I followed your recipe, but added 1 Tbl of prepared mustard. I learned to cook from my Memaw, who was born in 1866 and raised in Tennessee. She always added a little sugar to all her recipes. She told me that is the way here grandmother taught her how to cook. Because of the wars during her life, she said they used to use brown sugar or honey at times. If this was to be the only dinner, she would add carrots, cabbage, potatoes, turnips. She always made skillet cornbread from a cast iron skillet her grandmother gave her. I now make my cornbread with the same skillet. By the way, I’m 72 years old, so you can see how long that skillet has been used – it’s still in perfect conditioned. I love your newsletters and web site. I can find most anything to eat on there. Thank you, again for your wonderful recipes with pictures. This dish hits every spot. It’s delicious, economical, nutritious, and comforting. I used your recipe, everyone loved it. It makes a lot of food with little fuss and freezes beautifully. Perfect for a cold or rainy day and transports me back to simpler times. Win-win!I serve it topped with chopped onions and chowchow with hot water cornbread, collards, and fried potatoes on the side. Love your site and your stories. Someone asked about sugar. It is like salt, a little bit enhances the flavor. 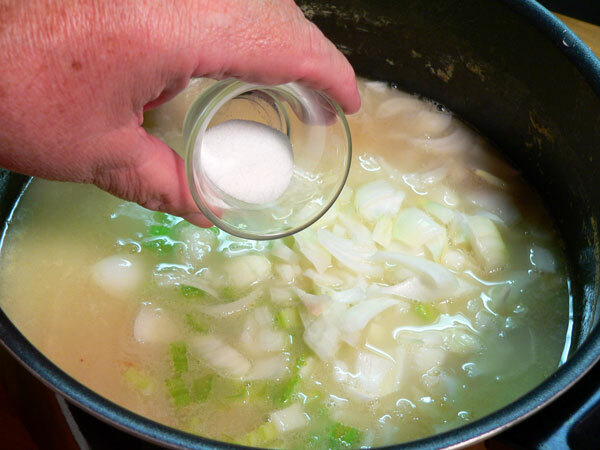 I usually add a bit of sugar when I saute onions or any veg before tossing into soup. The sugar caramelizes a bit and helps the flavor. 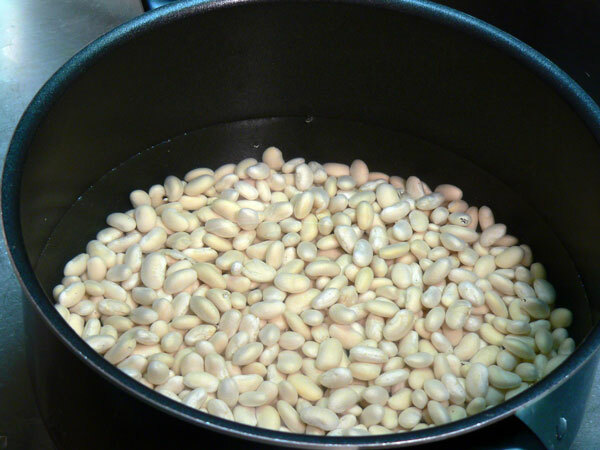 For thickening, I just smash a few beans against the side of the pot, I never add flour. 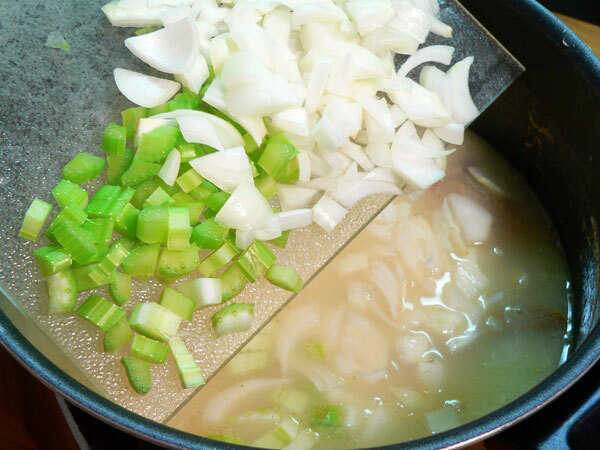 I love soups with lots of veggies – a one pot meal – so I like to add a diced potato to my bean soups. Extra nutrition and also thickener. On another of my random recipe searches, I was lucky to stumble across your site and this wonderful recipe. I did a smoked picnic last night – guess what’s for dinner tonight? We are one and a half weeks out from sons wedding and lots ahead to do – this will make for an easy dinner tonight. Know when I catch my breath, I’ll enjoy browsing the rest of your recipes. Thanks for sharing your life stories and the delightful foods that surely enhanced those days!! I had the ham bones left over after Easter and found this recipe. By coincidence, I had started soaking some heirloom beans grown and sold by Rancho Gordo (www.ranchogordo.com). Your recipe was a perfect marriage! While driving home from a trip to visit friends, I got a hankering for salisbury steak so cruised through the internet on my iPhone, and found yours! I am home now waiting for my husband to return from a trip to store to get the hamburger (the rest of the ingredients are in the cupboard). Thought I would check out some of your other recipes and I see that I will be putting my cookbooks down for a while, so I can catch up on some very delicious looking meals! 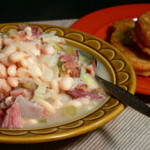 Next on my list is the ham bone bean dish, will have bone cook after Christmas! Love your photos and easy to follow instructions, can’t wait to start cooking tonight! Adding bag of great northern beans to my grocery list! Have ham bone in the freezer, celery and onions ready to go! Oh my. This Ham Bone Bean recipe is delicious. The only change I made was to use 1/2 tsp. of salt instead of 1 tsp. That little bit of sugar does something great for this recipe. I’ll try any bean recipe, hot or cold, as I love them. In 45+ years of cooking, this is by far the best recipe I’ve found. Gonna’ have to start buying beans in 50 lb. sacks now!!! Thank you, Steve. Just tried your recipe and it was the bomb! Hi Ron, I do hope you meant they were really good. (Smile) I do appreciate you trying our Ham Bone Beans recipe and I’m happy to hear that you liked them. Perhaps it will encourage someone else to give them a try. I’ve noticed in most of your recipes you use a little sugar. I’m from Tennessee and I use to watch my grandmother cook. She was a great cook and was always cooking something. But I hardly ever saw her put sugar in what she was cooking. I was just wondering what the sugar did what ever you were cooking. Thanks and have a great day. Hi Ted, Thank you for your question. Mama always said the sugar “just makes it better.” Her own mother passed away when she was just a child so not really sure where she picked up the habit of adding sugar from. Her and her sisters took to cooking at an early age as they had a large family and lots of mouths to feed. Never saw my Grandpa do anything in the kitchen so doubtful she learned from him either. Lots of kids just don’t like vegetables because they have a somewhat bitter taste. Adding just a little sugar can take away some of that, so I suspect it was used back then to get some of the younger kids to eat their veggies. I must admit, I never really questioned it growing up. I saw Mama do it, so I started following her recipes. 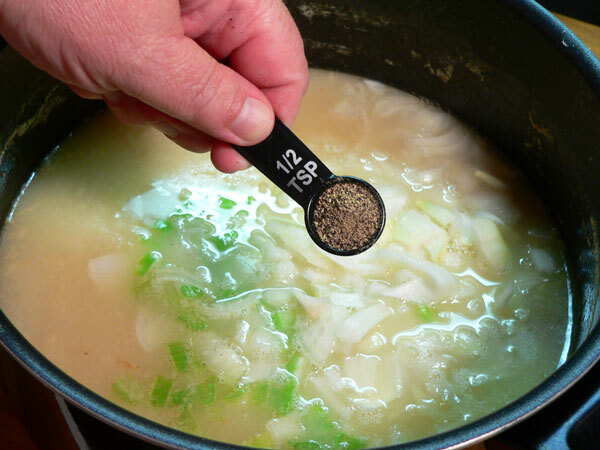 I often add a little sugar to my sauces and soups too. I remember watching my grandmother do it, and my mother as well. Sometimes they would skim “the bitter” off the top of a bubbling pot after adding a bit of sugar. Stir it up a bit, re-taste, smack their lips and say, “there”. Or, add a little more sugar till it “just makes it better”. Sugar is an ingredient that ‘just is’. Like you, I never questioned why. I found your site looking for a ‘real’ pudding recipe the way my Mom made it. Your step by step photos take the “does this look right?” guess work out of the equation. And since Mom’s not here to answer, Thank YOU! Today I learned how to chop my collards and keep them green while they cooked. Again, Thank You! Now, where is that ‘potlikker’ soup with cornbread dumplings recipe? I’m browsing your soup file, ah-ha “Ham Bone Beans”. I have a Ham Bone in the freezer! Thank You, Again! This is what Bean Soup should be. If I might add though, you forgot the final step. 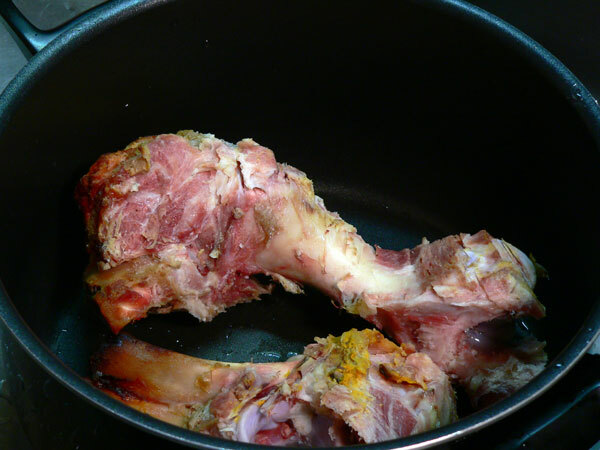 The Bone goes to your beloved furry companion, who has been patiently waiting since the pot began to simmer. Thank you for sharing your memories of Mama, wonderful recipes and family dinners. Your talent and passion is a wonderful gift that you graciously give to others. Bless your humor. It is appreciated. Hi Marjorie, Thank you for sharing your memories with us here on Taste of Southern. I’m thankful you found our site, and that you’re trying some of the recipes. I trust they all turn out well for you. I don’t have a dog, so didn’t think about that. It was a good suggestion though, so thank you for pointing it out. Many people learn to add a little sugar to help cut the acidic taste in meals with tomato bases (or other meals with an acidic flavor) and get into the habit of adding sugar because, as Steve says, “It just makes things better.” sometimes a little sugar is all it takes to knock a dish over the top, especially where kids are concerned. I’m not a culinary expert by any means…just a “fluffy” Paramedic from the mid-west that really likes good food!!! This was my first time doing anything with the leftover Christmas ham so figured I’d try making ham and beans, and it turned out amazing! Only changes that I made were that I shredded half a cabbage and added that as well as less than half a teaspoon of garlic powder. Also figured I’d try out the skillet cornbread at the same time, and that with the beans is pretty much a main dish on it’s own. Thanks for sharing these recipes! Hi Stacia, Thank You for trying our Ham Bone Beans recipe, I’m happy you liked it and that you made it your own with the addition of the cabbage. 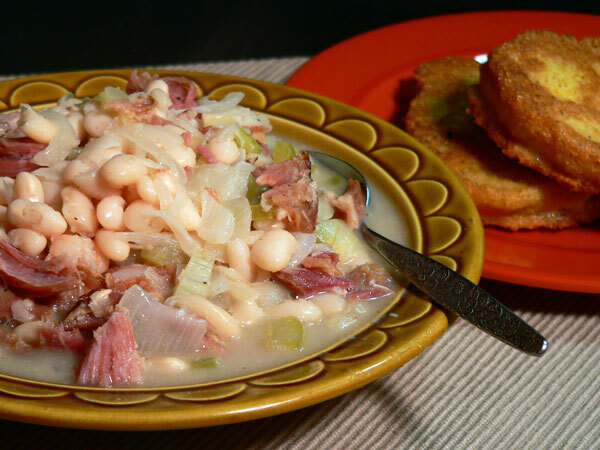 Yes, sometimes just some beans and cornbread can make a great meal on it’s own. Keep up the good work.